Quality-crafted with attention to detail, Revere products combine outstanding beauty and strength with the luxury of a low-maintenance finish. Backed by more than 40 years of manufacturing expertise, it is their company-wide commitment and never-ending ambition to produce the very best building materials - products deserving of their good name and worthy of the place you call home. 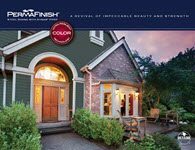 Two of the world’s best performing materials come together in PermaFinish steel siding. This high-performance Galvalume® AZ-50 steel with Kynar® PVDF coating technology delivers on every promise for enduring beauty, impressive strength, uniform quality and a markedly refined appearance for your home. 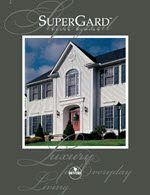 SuperGard’s superior construction is visible from the start. Built to withstand even the most punishing weather, each high-performance Galvalume® AZ-50 steel panel is virtually “weather-sealed” in a thick PVC finish that’s three and one-half times thicker than most conventional coatings. The uncompromising endurance of this heavy-gauge siding promises lasting beauty and protection for your home. 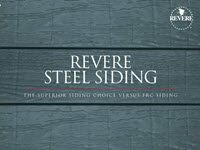 Revere PermaFinish compared to fiber-reinforeced cement siding.